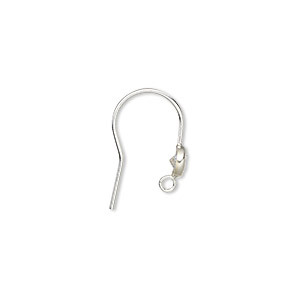 Ear wire, antiqued sterling silver, 23-25mm fishhook with 10mm round and open loop, 19 gauge. Sold per pair. Item Number: H20-8783FD Have a question about this item? Make the difference between common and extraordinary! 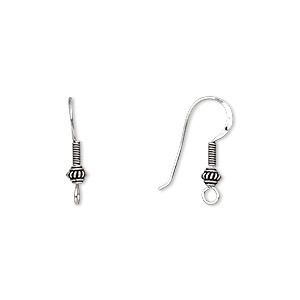 Ear wires come with bottom loop, ready to attach to your favorite drops. Sturdy wires keep their shape. 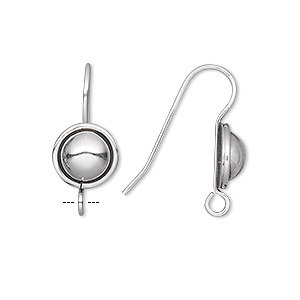 Ear wire, antiqued sterling silver, 26mm fishhook with 5mm fancy round and 5mm coil with open loop, 20 gauge. Sold per pkg of 2 pairs. Ear wire, cultured freshwater pearl (bleached) and sterling silver, white, 29mm fishhook with 5.5mm round and open loop, 19 gauge. Sold per pair. 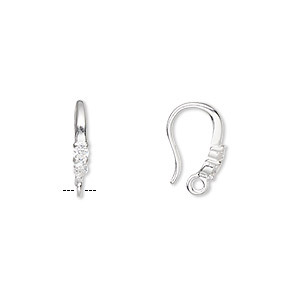 Ear wire, cubic zirconia and sterling silver, clear, 13mm fishhook with 2mm faceted round and closed loop, 19 gauge. Sold per pair. 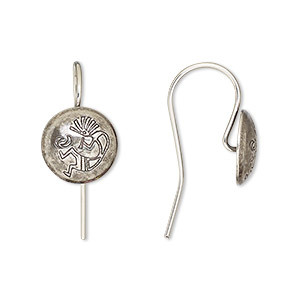 Ear wire, antiqued sterling silver, 19mm fishhook with 10mm Kokopelli concho, 20 gauge. Sold per pair. 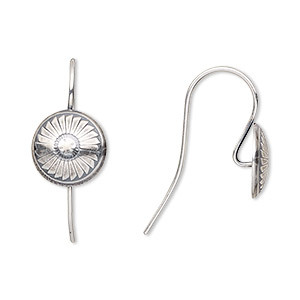 Ear wire, antiqued sterling silver, 20mm fishhook with 10mm radial feather design concho, 21 gauge. Sold per pair. 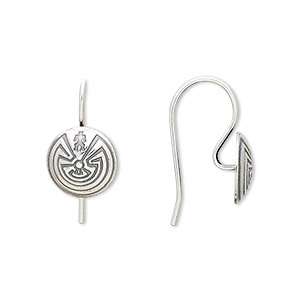 Ear wire, antiqued sterling silver, 19mm fishhook with 10mm labyrinth and man concho, 20 gauge. Sold per pair. 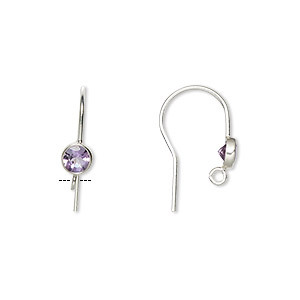 Ear wire, amethyst (natural) and sterling silver, 15mm fishhook with 4mm faceted round and open loop, 20 gauge. Sold per pair. 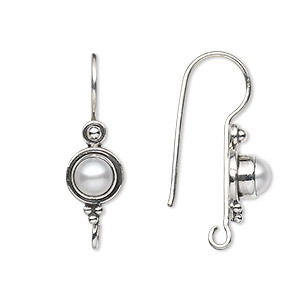 Ear wire, cubic zirconia and sterling silver, clear, 15mm fishhook with 4mm faceted round and open loop, 20 gauge. Sold per pair. 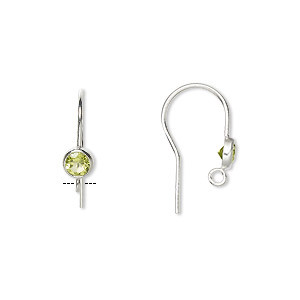 Ear wire, peridot (natural) and sterling silver, 15mm fishhook with 4mm faceted round and open loop, 20 gauge. Sold per pair. 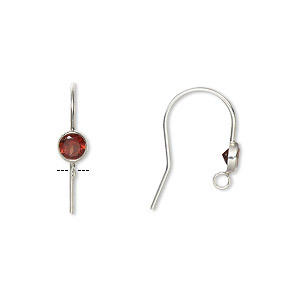 Ear wire, garnet (natural) and sterling silver, 15mm fishhook with 4mm faceted round and open loop, 20 gauge. Sold per pair.